Tennis is a sport that often invites a passionate and nerdy relationship. I started Tennisnerd with the humble idea of broadening the knowledge about tennis racquets, strings and gear without bias to sell a certain product or brand. And here I am asking you to support Tennisnerd and get a t-shirt! The idea with Tennisnerd was never to make money. It is partly an online marketing experiment (since I have been working in marketing for 10-15 years) and even more so a work of passion (my love for tennis started at a young age). From really modest beginnings it has grown to a really popular website/social media presence and it brings me a lot of joy to read your encouraging messages in comments and e-mails. 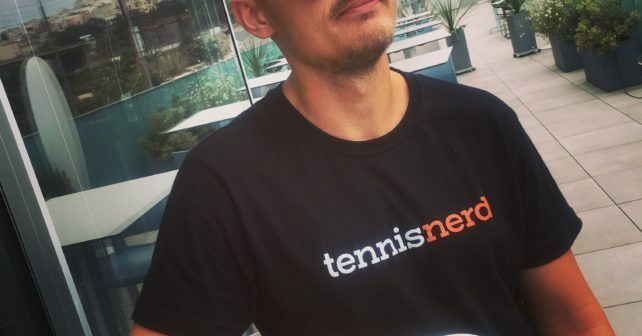 But running this kind of website costs both time and money, so I thought I would ask if anyone is open to support Tennisnerd with 25 euro or more and I will send you a Tennisnerd t-shirt (shipping incl). This t-shirt will magically make you play better tennis. Promise! 🙂 No, but you will look even cooler on and off court than you do today. I have a limited supply, but if there is any interest, I will print more shirts. I have also set up a Loyalist Tennisnerd webshop if anyone finds that option easier. If you are in the U.S. the product will surely reach you faster. If you decide to do it through the website you can just donate 25 euro or more below and add your address (and size!) in the message and I will send you the t-shirt as soon as my legs carry me to the post office. Support Tennisnerd – What else do you want to see? T-shirts and branded gear is just a fun experiment, but I am planning on creating more video content (not only reviews). I also have an idea to write an e-book “Tennisnerd Guide to Tennis Racquets and Strings” where I would collect and organize the most useful content (as well as add lots of new stuff of course), for people interested in getting more out from their tennis gear. Would this be something you would be interested in? Please comment below in that case! Is there any other type of content and information you would like on Tennisnerd? All ideas are welcome. You can comment or e-mail me. I would still be happy to get some guest writers on here from time to time, so send me an e-mail at helloATtennisnerd.net if that is something you would be interested in. That is all for now! Thanks for all the kind words and for supporting Tennisnerd. Writing an e-book or other type of structured overview document based on all your racquet reviews (and intelligence gathering) would be an interesting read and reference source. Perhaps it would show how some design trends repeat themselves? how bout sweatbands? dampeners? buttcap stickers? towels? when I click on the DONATE button I am redirected to PayPal homepage and not to a specific payment. Hope all is well. Something wrong there! Will try to fix asap. Otherwise just e-mail me and I will send you the info. I really appreciate the support! I’ve been using the Babolat Pure Drive Tour Plus in my last few tournaments and I have had some success with it. However, I found stringing it with Solinco Hyper G 16L(1.25) at 24kg makes the serve and shots lack power. I need a very powerful serve for my game while maintaining control and consistency on groundstrokes. What strings and tension do you recommend for maximum spin, and high levels of power, control, and good comfort? I will be sure to donate to your site as its brilliant. Hands down, one of the best sites around for tennis. I visit it all the time. Will be rather sad if it closed down. I’m really considering using Luxilon Alu Power 16L in the Babolat Pure Drive Tour Plus due to its power and control, but I don’t know what tension to use. Most people string it around 25kg (including pros) to gain control and confidence with groundstroke swings. However, they also complain about comfort issues. The other issue is of tension maintenance, which is why they generally string it at higher tensions to account for it. I know you generally recommend 22.5kg for Alu Power. I’m just wondering if you feel I will get enough control and playability duration (3-4 weeks) with those strings at 22.5kg in an already powerful racket. Yes, the Tour Drive Tour Plus will be a rocket launcher at 22,5 kg I believe. I think 24-25 kg works best for powerful racquets strung with poly, but yes the arm might hurt from it (not always the case). You could add some silicone or blu-tack in the handle to help some vibrations, but the feel might be too stiff anyway. What you could do is to string the mains with a poly at 25 kg and string the crosses with a synthetic gut or multifilament string at 25-26 kg to help soften the feel but still maintain the spin. You would have to play around a bit here and see what works, but you definitely need to string a bit higher in these racquets. I answered a related question about trying a hybrid string setup to see what it does. But you could put the poly in the main so that you still get ample spin and control. If you lack power at 24 kg, you can go down to 23 to test. For me it results in too much power, but that is a personal thing. I really like HEAD Hawk Touch in power racquets, so try that at 23 kg and see what it does for your game. Another reader like Solinco Barbwire in the PD Tour Plus, but at around 25 kg as well.